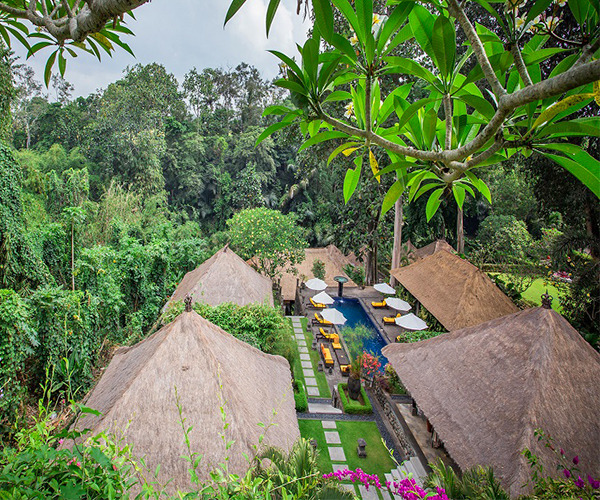 Located on a private estate on the pristine island of Bali, the Sukhavati Ayurvedic Retreat & Spa is a five star retreat, spa and wellness resort offering life changing treatments based on the ancient healing arts of Ayurveda and the Vedic wisdom of life and living. Highly qualified and experienced healers, motivators, natural therapists, and yoga and meditation teachers help guests address health issues and connect with the true nature of wellness in an environment of exceptional service and standard of care. The Mengwi Badung Spa features luxurious open air spa treatment rooms staffed by eight Ayurvedic spa therapists and specialists. Guests at Sukhavati dine on delicious vegan cuisine made with locally-sourced and organic ingredients and also enjoy biking, guided hikes, a yoga pavilion, meditation area and swimming pool. Sukhavati Resort & Spa offers individually prescribed and specialized health and wellness programs combining Ayurveda, yoga, meditation and diet to balance the mind, body and soul and overcome stress and health issues. The immersive Ayurvedic Retreat & Health Program consists of spa treatments, yoga, a customized diet, meditation, daily health consultations and lifestyle seminars. Programs ranging from 1 to 21 days are available, along with yoga retreats, rejuvenation programs and events with specialists and guest speakers. The luxurious spa offers holistic Ayurvedic health consultations, Shirodhara, Abhyanga, Pizzichilli and Panchakarma therapies, along with an array of healing massage, nourishing facials, pampering beauty treatments, and relaxing foot massage. This exclusive villa estate offers each guest a comprehensive wellness program based on traditional Ayurveda, combining luxury and service with the science and art of diagnosis and healing. Sukhavati‘s team of wellness specialists, overseen by Ayurvedic Doctor Mithun Raju, welcomes guests with specific health concerns, such as allergies, anxiety and depressions, chronic fatigue, gynecological issues and fertility, diabetes management, cancer support and sports recovery. Sukhavati hosts a wide range of facilities including the main swimming pool, three Private Pool Villas, the Yoga & Meditation Pavilion, and the River Deck where guests sink into a day bed and bask in surroundings found nowhere else. Rejuvenation Program guests stay in one of eight beautiful modern Balinese villas complete with thatched roofs and elegant bathrooms, or for added luxury, one of four private pool villas. 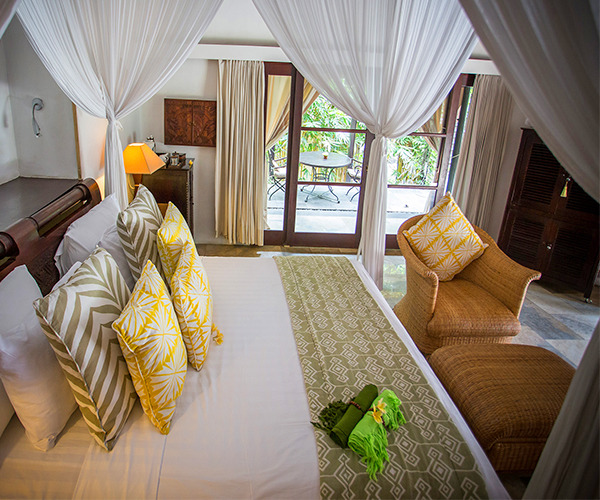 River Spa Treatment Pavilions are located on the lowest tier of the estate overhanging the peaceful Penet River. Gourmet chefs prepare beautiful, fresh vegetarian and vegan cuisine and a range of specialized Ayurvedic dishes, working with Sukhavati’s specialists to create a healing dining experience for every guest. Fresh ingredients are sourced from local growers and markets and seasonally grown at Sukhavati, using organic farming methods. There are many dining options, including full butler service on your private villa balcony.